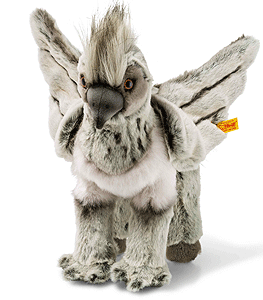 Buckbeak is Steiff's interpretation of the character from the Harry Potter film and is hand made in beautiful grey and beige cuddly soft plush. Buckbeak is a Hippogriff. Hippogriff are creatures that can fly; they have the front legs, wings and head of a giant eagle with the body, tail and hind legs of a horse. They are also known to make noble companions when shown respect and Buckbeak becomes a fond pet of Hagrid's.